There are two possible approaches for activating/deactivating a pane - using the ActivePane property of the RadDocking control or using the IsActive property of the RadPane. Both approaches will lead to the same final result but could be used in different scenarios. Using the IsActive property of the RadPane is useful when you want to activate a pane but do not have a reference to the RadDocking control itself. 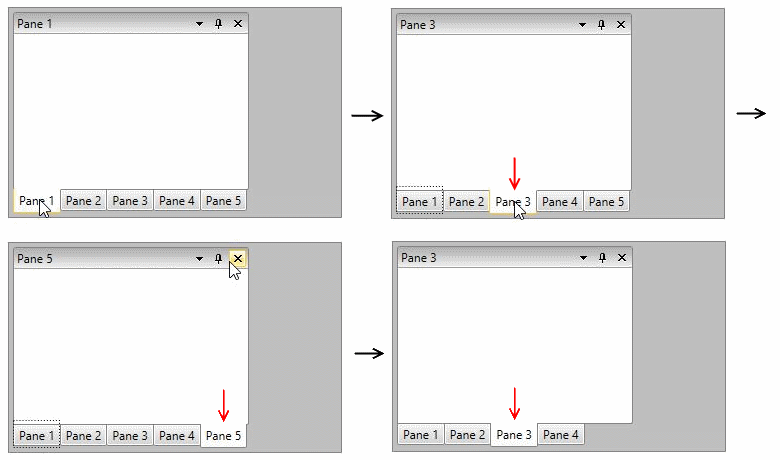 Examples 1 and 2 show how to activate panes through the IsActive property. By default the next non-disabled and visible RadPane in the PaneGroup is activated when the current active one is closed. First: Activates the first non-disabled and visible RadPane in the Items collection of the PaneGroup and if there isn't one - the first non-disabled and visible RadPane in the Items collection of RadDocking is activated. Last: Activates the last non-disabled and visible RadPane in the Items collection of the PaneGroup and if there isn't one - the first non-disabled and visible RadPane in the Items collection of RadDocking is activated. Previous: Activates the previous non-disabled and visible RadPane in the Items collection of the PaneGroup and if there isn't one - the first non-disabled and visible RadPane in the Items collection of RadDocking is activated. Next: This is the default mode. Activates the next non-disabled and visible RadPane in the Items collection of the PaneGroup and if there isn't one - the first non-disabled and visible RadPane in the Items collection of RadDocking is activated. LastActivated: Activates the previous activated RadPane in the Items collection of the PaneGroup and if there isn't one - the first non-disabled and visible RadPane in the Items collection of RadDocking is activated. If no pane can be activated no action is performed and the value of the ActivePane property is set to null.